Car Rentals: Atlas can negotiate special rates based on your travel volume. We also work with all corporate and individual programs. Computerized Profiles: Corporate and individual information is stored in our computer. This eliminates the need to repeat basic information for each reservation. We also note individual traveler’s preferences. Delivery Service: Overnight delivery service, or via electronic ticket. Because of frequent changes in travel plans, for paper tickets we normally deliver documents within a day or two of travel. Discounted Parking: Atlas will include discount parking coupons with each ticket. Centralized billing and negotiated rates are available upon request. 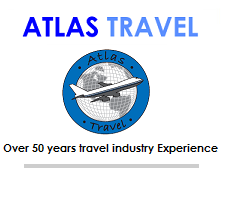 Frequent Flyer Programs: Atlas will assist you with your airline frequent flyer memberships. Group and Incentive Travel: Atlas will negotiate group rates, arrange for meeting space and plan incentive trips. Hotels: Atlas belongs to the Computerized Corporate Rate Association, which contains over 12,000 properties worldwide. Atlas clients can get reduced rates at any of these hotels. International Documentation: Atlas will provide assistance and forms for passports and visas. Seats: Atlas Travel will assign specific seat requests and place your reservation in a queue to get your required seats up till the day of departure if they are not available at the time of booking. Vacation Travel: The Atlas staff will work hard to find you the best rates available for your vacation itinerary. We can also arrange land packages to go with your frequent flyer awards.